Sixteen men, lined up. They seem to be having a good time. Some are older, some younger. A historian of fashion might be able to tell us their relative social status, and perhaps their trade, by looking at their clothing. In the background, three men are observing and comparing notes. To the right is a church, and to the left is the village. Is it an early early depiction of the hokey-pokey (“You put your left foot in…”) ? Although the scene obviously has some social aspects, the primary activity depicted here is standards development, particularly the historically mandated procedure for determining the linear measurement known as the “rood”, related to the English “rod”, the German “rute” and the Danish “rode”. 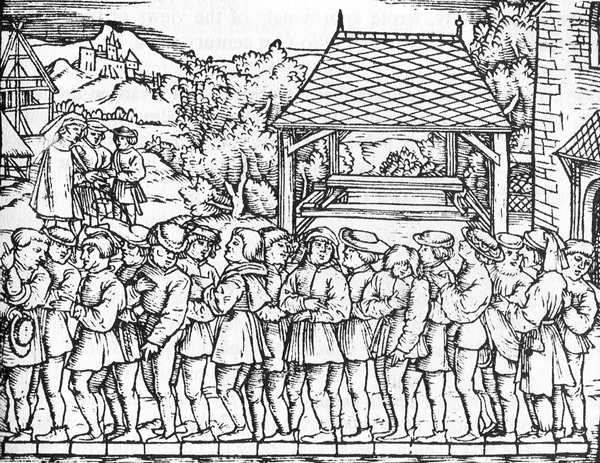 Stand at the door of a church on a Sunday and bid 16 men to stop, tall ones and small ones, as they happen to pass out when the service is finished; then make them put their left feet one behind the other, and the length thus obtained shall be a right and lawful rood to measure and survey the land with, and the 16th part of it shall be the right and lawful foot. From a technical point of view, you might wonder why they didn’t have a standard rule, a metal bar etched with two lines, something tangible which could be carried about and used to calibrate? But who would maintain the standard? And would you trust them? Physical objects may be counterfeited, replaced, shaved, distorted, even stolen. Those who are buying land would like a longer rood, and those selling land would like a shorter rood, so the motivation for fraud is clear. But the average length of the feet of 16 random men — that is probably not going to change much in a given town, or even across a country. Compared to the logistics required to create, duplicate and distribute a standard rule, the described statistical approach is easier to administer and was accurate enough for the time. But there is more to it than that. Why didn’t the surveyor just measure his own feet? Or those of his friends? And why require that it be done at church? Why not wherever the surveyor wants to do it? There must have been something about the process itself, the lining up and being measured, publicly, neighbor beside neighbor, next to the church, that lent it legitimacy. These men are literally voting with their feet. The transparency of the process is also notable. The rood was determined in public, at the time and place most likely to offer everyone in the town the opportunity to observe. It is hard to cheat with the public watching. Anyone there trying to wear clown shoes or going barefoot would be immediately detected. Also, it is notable that participation was on an equal basis. No one was able to say, “I am a rich merchant, so I should be allowed to bring 5 pairs of my shoes and line them up in front of me”. And certainly no one could say, “I am the King, the standard is determined by my foot and my foot alone”. This is good, because the variation from King to King would tend to be much greater than the variation from different random samplings of 16 men. I guess it would be too much to ask that they would include women. It is good to know what you’re thinking, I’m guessing that it is pretty complex in there. My wife said the same thing — why not allow women? Since women’s feet, on average, are smaller than men’s, you would need to adjust the procedure somewhat. You would want a fixed ratio of the sexes, not a random one. So perhaps require exactly 8 men and 8 women. Also, I wonder what clothing women wore to church in this town. Large dresses? Hoops? Would they be willing or even able to stand heel to toe like that? Would it have been improper for an unmarried woman to participate in mixed company with the rough tradesmen? Considering the scandal caused by the introduction of the waltz centuries later, I imagine the determination of the rood would have been considered crude and rude if they mixed the sexes. That said, if anyone were to measure a rood today, I would certainly encourage broader participation. And is it 16 because this is easy to divide by 2 repeatedly to find a single foot? Perhaps a statistician could tell us whether 16 men is enough to give us an accurate value. @Chris, that’s my guess. I’m assuming the surveyor did not have an accurate yardstick to measure the 16 feet. So he couldn’t just measure that and divide by 16. (If he had an accurate measure then this whole procedure would have been unnecessary). But if measured off with a rope or a line in the dirt, he could divide by 16 by repeated folding and cutting of a rope, or repeated bisection with a compass and straightedge. What makes you think that this was how they did things in those days? At the same time this book was written, people in that part of Europe were making precision instruments. My guess is that the also had metal rods, something like the national prototype yard-rod of Elizabethan England, accurate at least to the nearest millimeter.